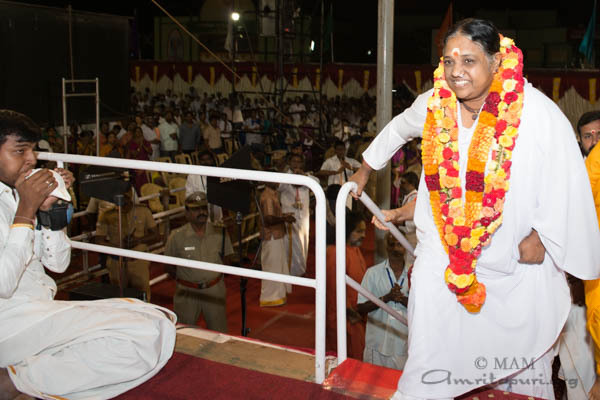 After Kanya Kumari, Amma visited Tiruvananthapuram, the capital of Kerala, for the annual Brahmastanam Festival. 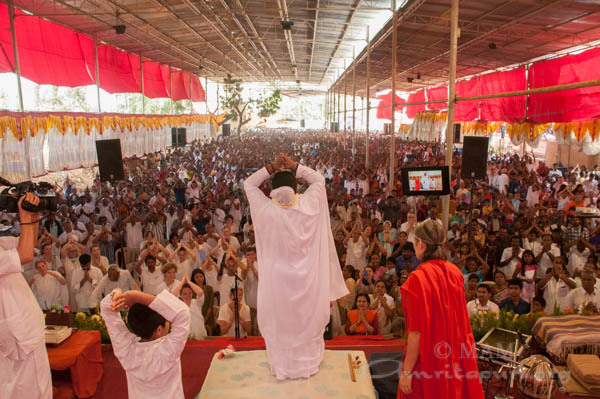 The local AYUDH youth group had been very active in preparing the programme and helped in all fields of seva. 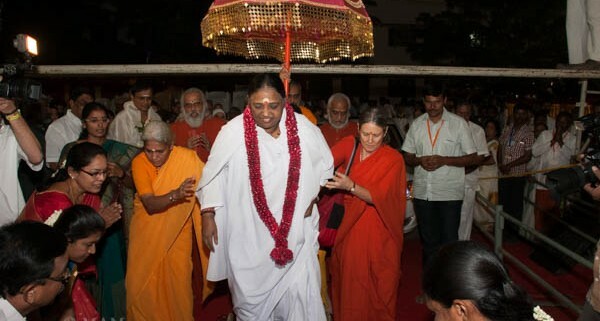 To welcome Amma to the city, they held a 20 km long bike parade. 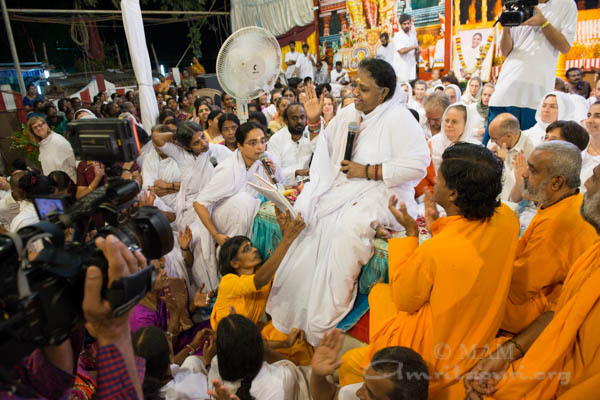 Once Amma arrived at the ashram she served prasad dinner and sang bhajans. 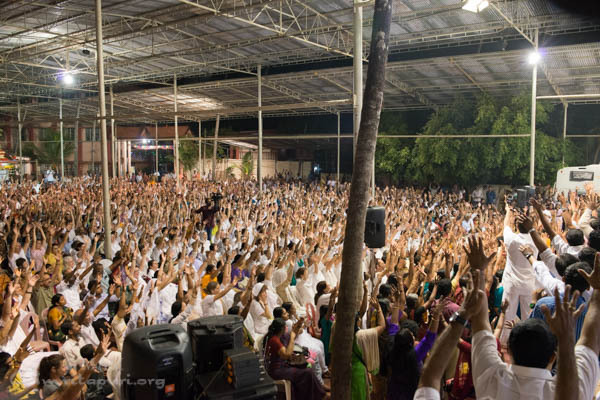 Then she asked everyone to meditate and pray for world peace. 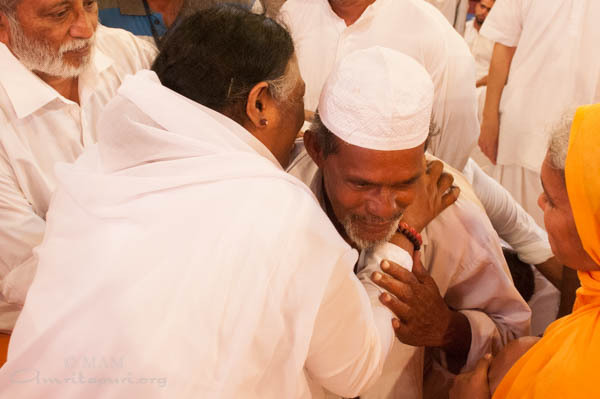 Amma has been making this request at every stop of the tour -telling her children to imagine white flowers of peace falling like snowflakes, spreading peace within and across the world. 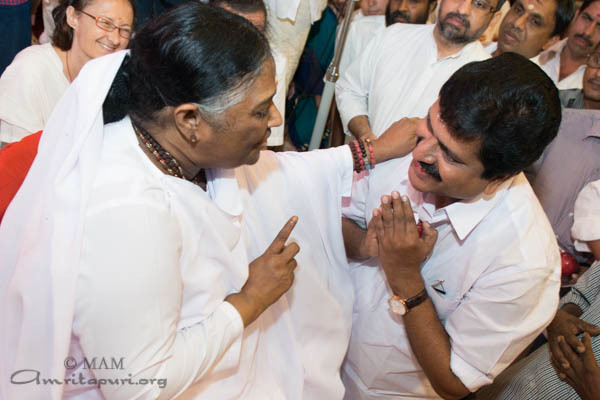 Many renowned personalities came to seek Amma’s blessings. 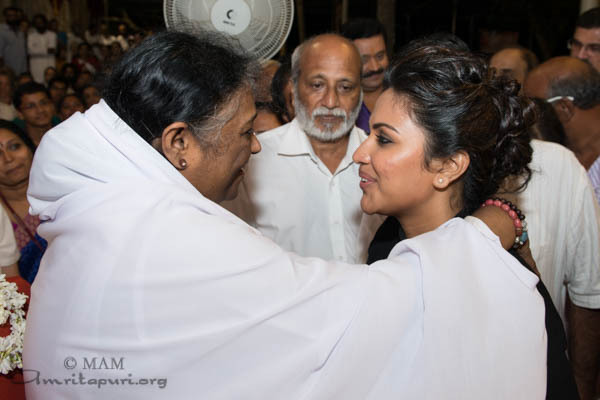 Amongst them were Shivakumar, Minister for Devaswam, cinema film stars Suresh Gopi and Amala Paul, and singer Ramesh Narayan. 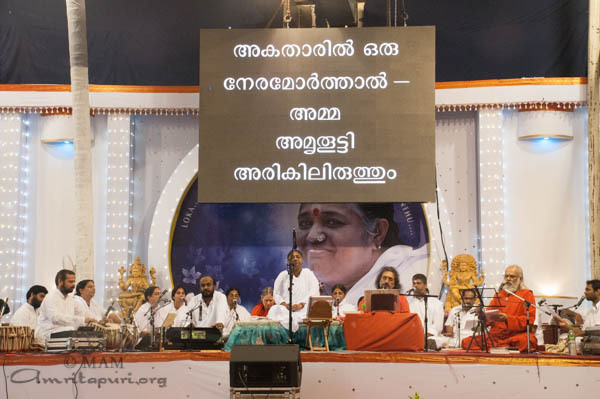 Children of the Trivandrum Amrita Vidyalayam also displayed stunning performances of both Eastern and Western culture. 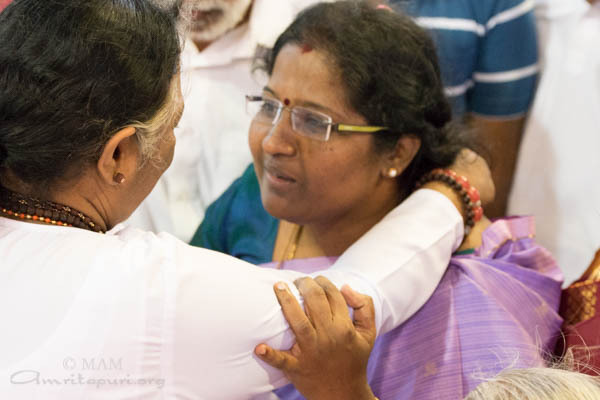 With this, the first leg of Bharat Yatra 2015 came to an end, leaving all of Amma’s local children, as well as the 800 people accompanying Amma on this tour, with many beautiful and blissful memories – the real ‘selfies’ of the heart, remaining forever with her children. 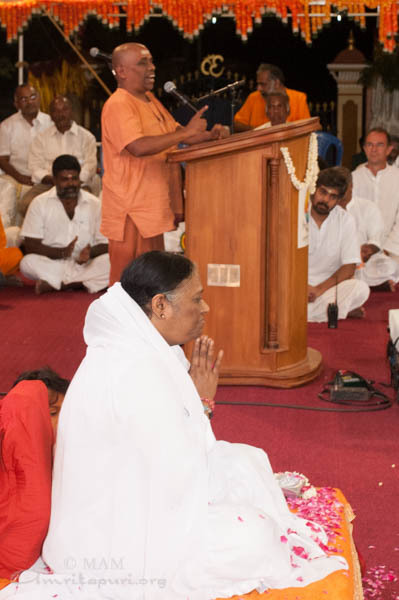 Amma held a public programme on the grounds of at her Amrita Vidyalayam school in Kanyakumari. 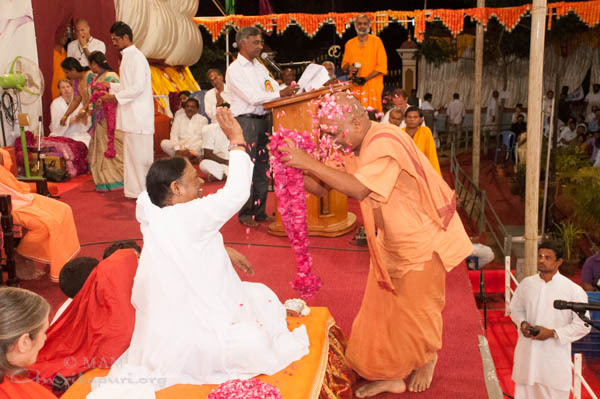 Amongst the dignitaries at the function were Swami Chaitanya Maharaj and Pon Radhakrishnan, Minister for Surface Transport. 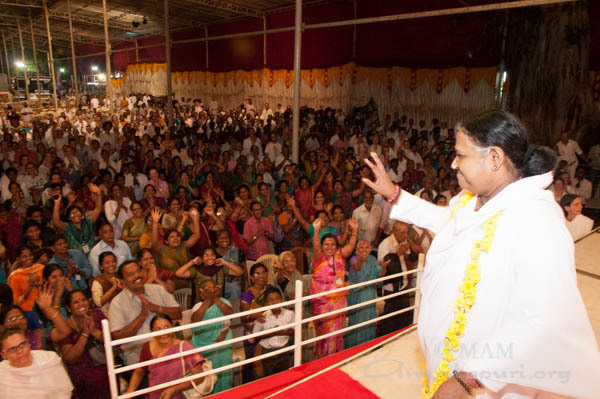 Kanyakumari being the centre of the Vivekananda Kendra, many of it’s members came and payed their tribute to Amma. The students of various local schools actively participated in the Amala Bharatam Campaign, cleaning the entire programme premises and educating the the public about recycling and composting. 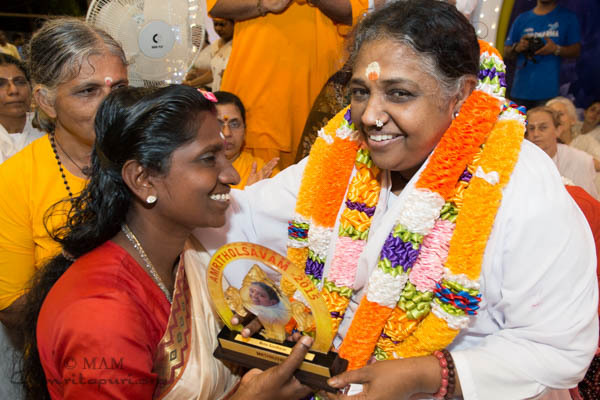 Earlier, upon arrival in Kanyakumari on Jan 21 Amma held satsang and bhajans and distributed prasad dinner to one and all on the rooftop of the Amrita Vidyalayam. 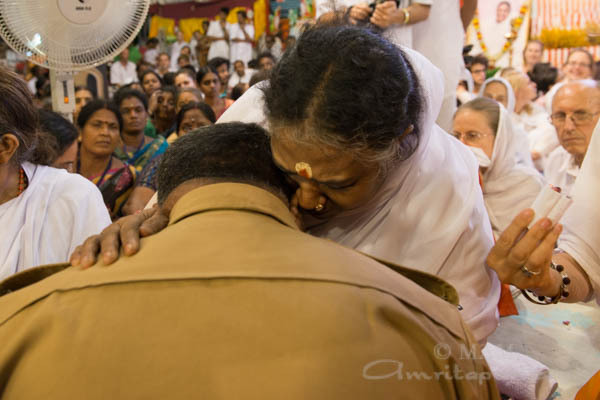 As darshan came to an end on Jan 23, the sun was rising over Amma’s shoulder. 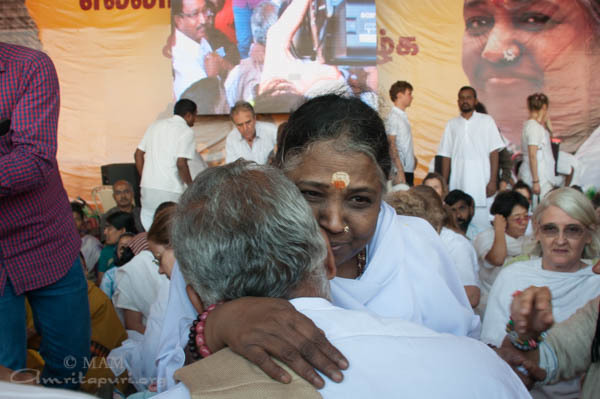 Another day had started – a day when Amma was to console and guide thousands more along the path of love and peace. 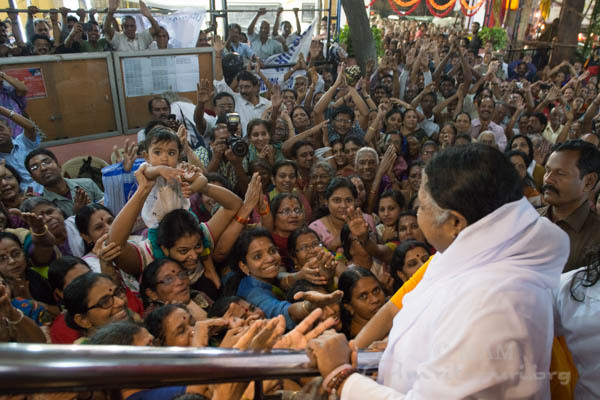 On January 20th, Amma visited Virudu Nagar. 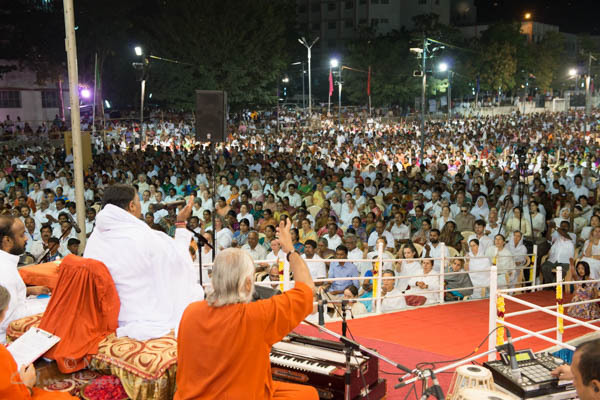 The programme was held at the Khatriya Vidya Salai and included Amma’s satsang, bhajans, manasa puja and darshan. 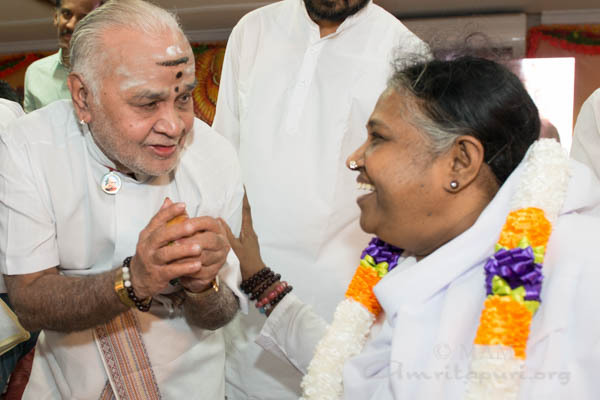 Welcoming Amma to Virudunagar, BJP State Presedent Tamizhisai Indira Soundararajan said: “A flower that removes the pain and sorrow of all, that gives joy and makes everyone smile, that spreads peace to one and all – what is that flower? 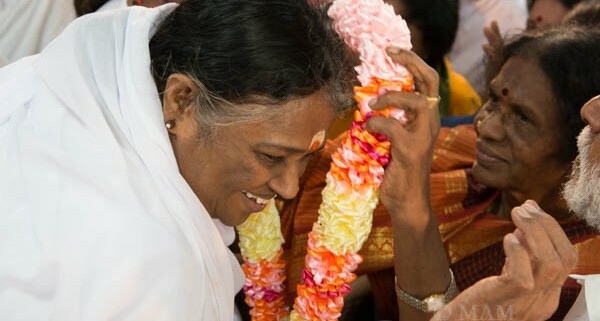 It is Amma’s divine smile (Sirippu). 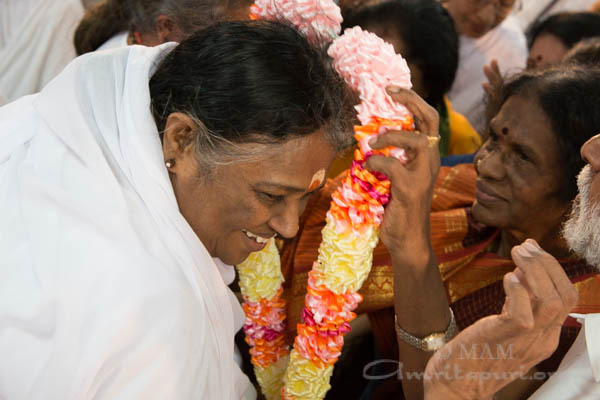 “People come to Amma with a load of sorrows that can be likened to carrying a rock. 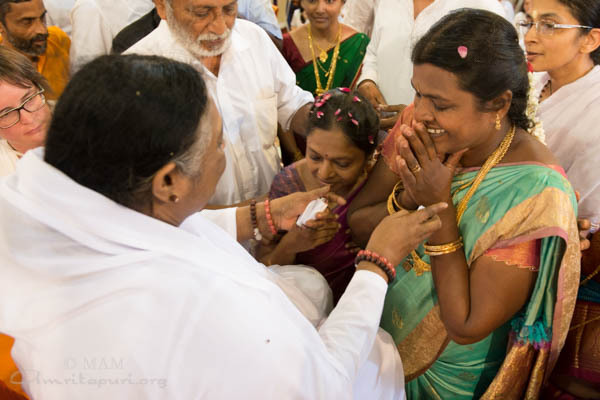 But when they receive Amma’s darshan, they feel light and fly like butterflies. No matter how much medicines a doctor gives, he can not remove the mental disease of the patients. 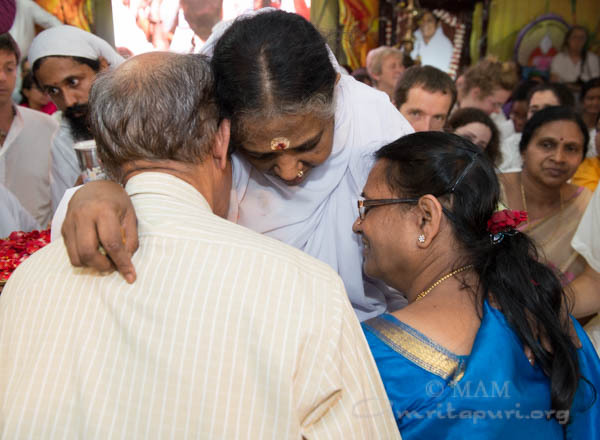 Only Amma can accomplish this curing of the heart and make people feel comfortable. 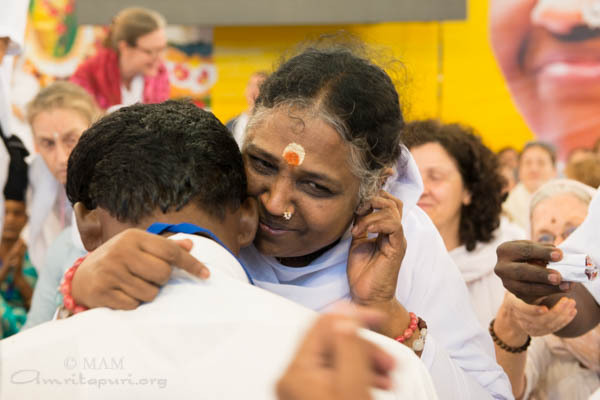 “Amma’s hug is meant to be the connection with the Atman. 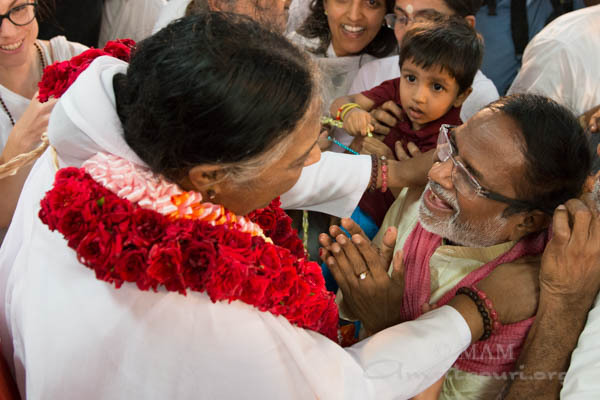 This connection is possible because of Amma’s love towards everyone. 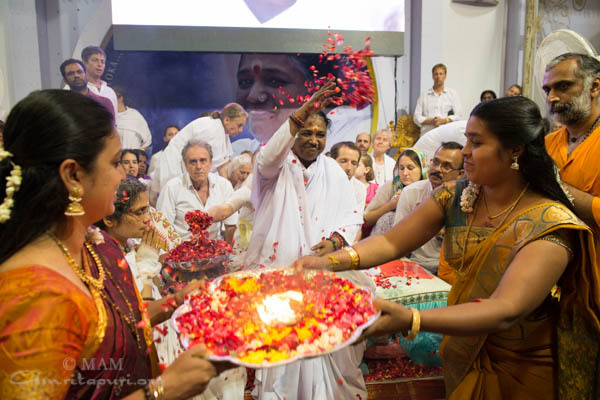 On today’s Amayasya day (no moon day) Amma has come as the full moon that gives joy to all. She is the light that removes the darkness within and without. 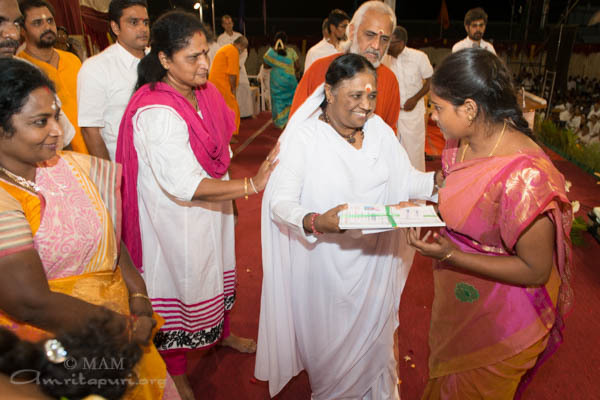 During the public function, Amma distributed certificates for students of Embracing the World’s Sivakasi JSS programme to acknowledge the successful completion of their vocational training courses. 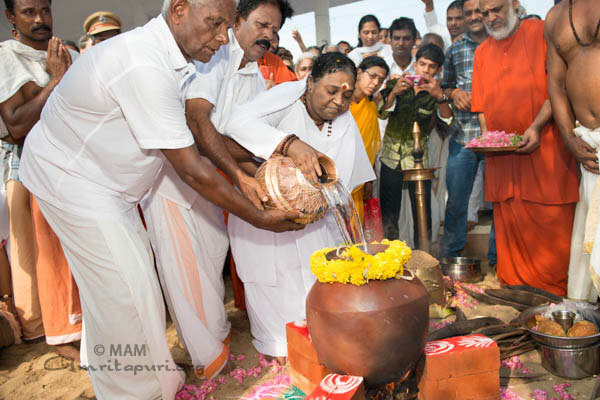 During the last hours of the programme, local devotees brought the traditional ‘mulapari’ mud pots to Amma, performed a dance and received her darshan. 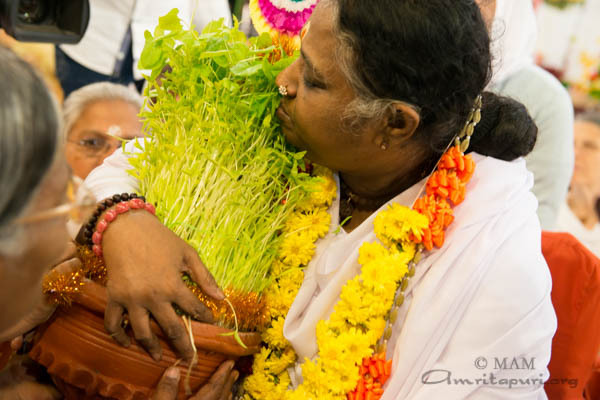 Amma embraced not only every devotee, but also each pot and plant that was brought to her. 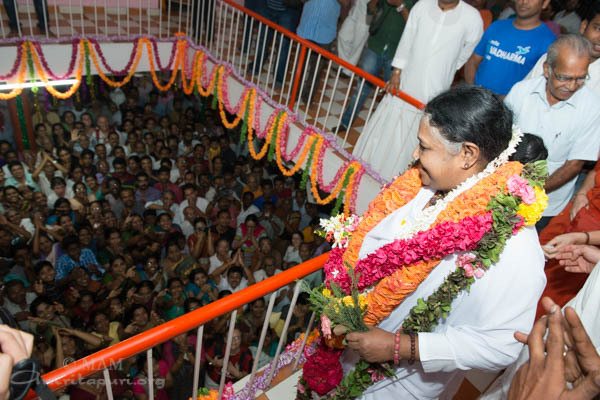 It had been more than 30 years that Amma visited Virudu Nagar. 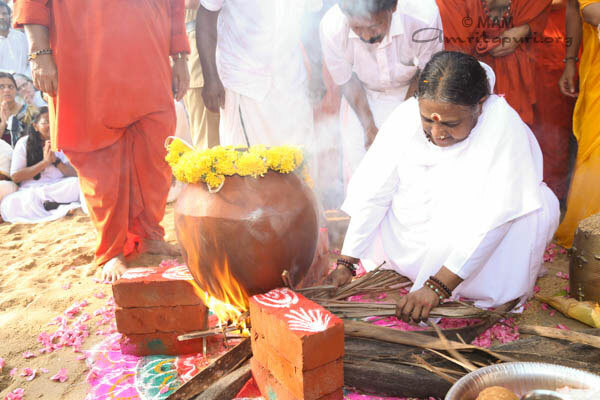 The last time had been in 1983, when she held a programme in the temple Periyar Kaliamman Kovil. 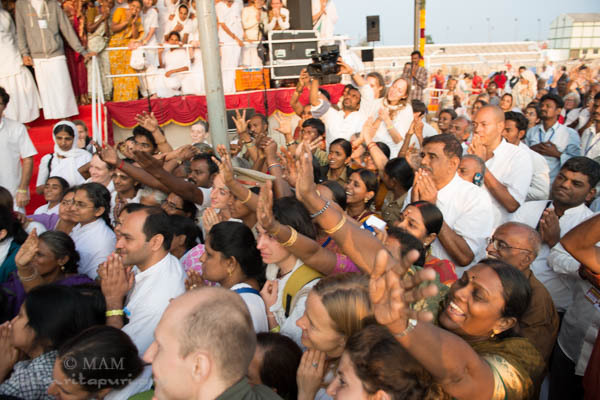 As the sun rose in the eastern sky, Amma still continued giving darshan. 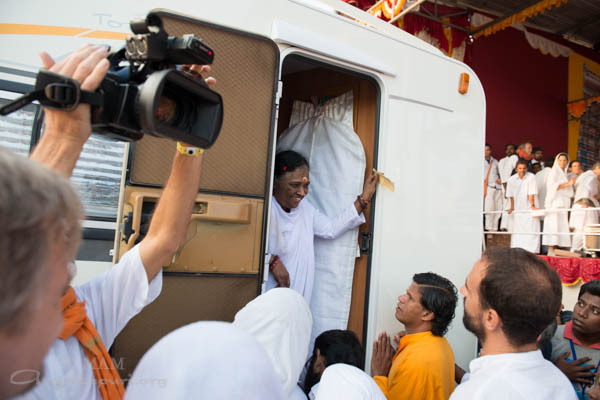 Fully radiant like a sun of love, Amma finally entered her camper, casting one last glance and smile at her children of Virudu Nagar. 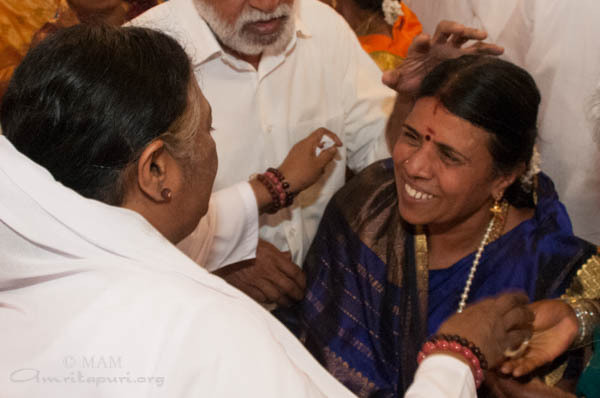 Along with many other beautiful memories of Amma’s programme, this smile will remain in the hearts of the devotees forever. 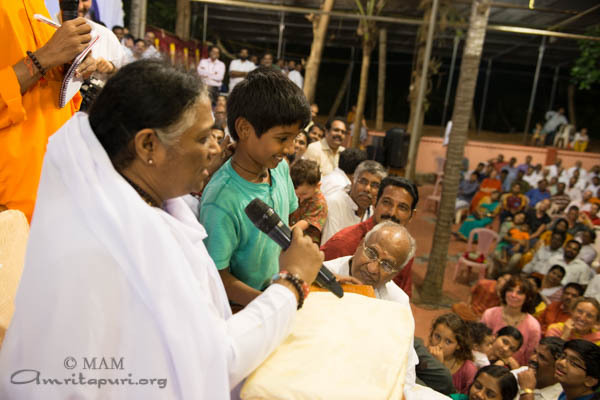 After Amma had distributed prasad dinner at her Madurai ashram on Jan 16, she encouraged her children to put questions to her. 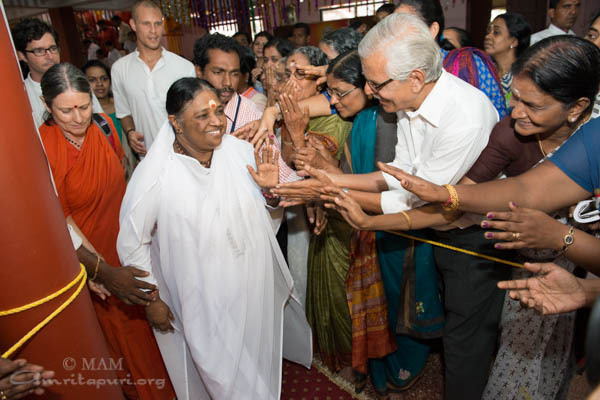 Amma said that the quality of the questions asked indicates the spiritual evolution of the questioner. She said, “To know the taste of the sugar inside a bag, there is no need to taste the entire stock. It is enough if we try a sample from the bag. To check if the rice is boiled inside a bowl, there is no need to examine all of it. It is enough if we test one or two grains. Similarly, to know the spiritual evolution of the disciples, it is enough to hear a few of their questions. 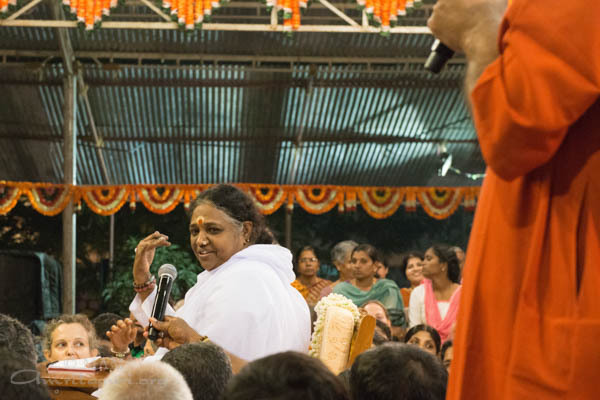 Encouraged by Amma’s words, one of the devotees requested Amma to elaborate on the Upanishadic statement Tatvamasi (Tat – Tvam – Asi; Thou Art That). 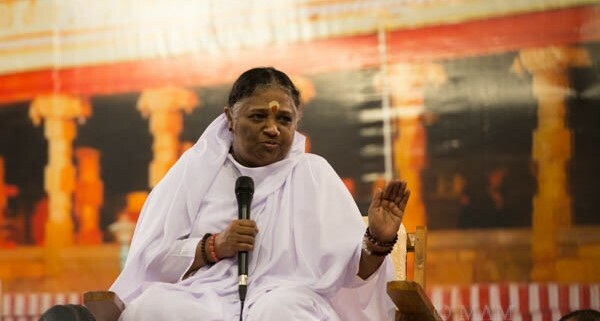 Amma said, “It is very easy to repeat such statements. But one needs to realize the truth indicated by them. 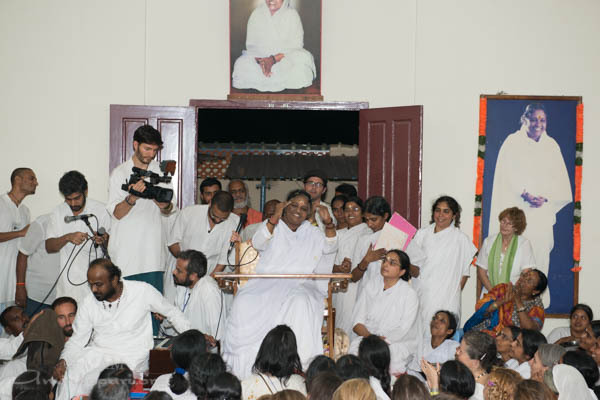 Just as the electric current passing through the bulb is separate from the bulb, your true nature is different from your body. Of course, the light comes through the bulb but it doesn’t belong to the bulb. 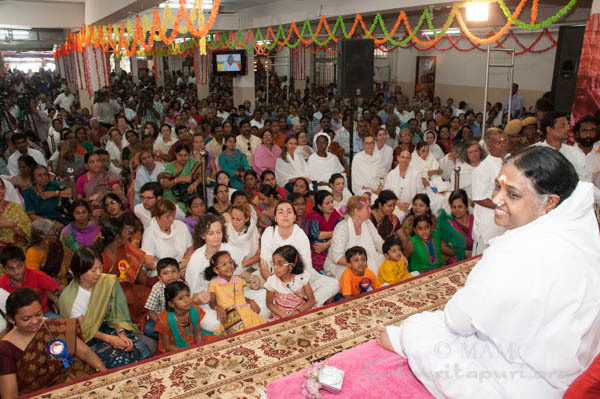 Your true nature is the Atman. 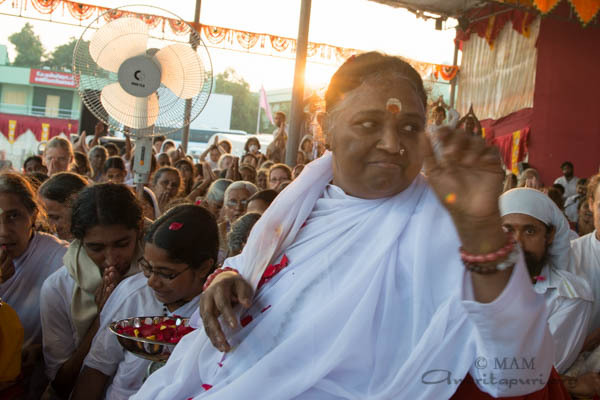 If you realize the pure self, you become an all-knower. (Knowing that the Atman is the essence of all things and beings). “Suppose a person by the name Madhavan passes by. 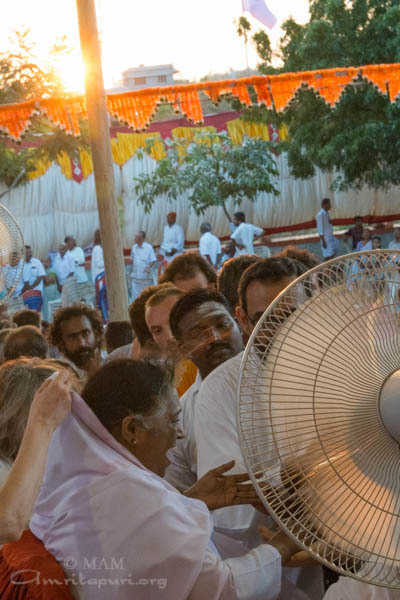 One might say, ‘Madhava is passing by.’ And, if he dies and people are carrying his dead body, one might say, ‘Madhavan’s dead body is passing by.’ What is that which enlivened Madhavan’s body? It is the indwelling consciousness. That is your true nature! “Usually, people answer the phone by saying, ‘Hello! I am so and so speaking’. Everybody says ‘I am’ while answering the phone. 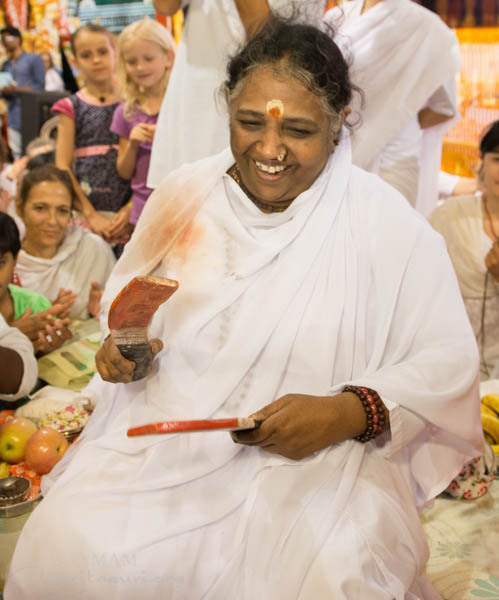 ‘I am’ is universal. The ‘I’ is the indwelling consciousness. “Say, there are 1000 pots of water kept in a place. And the sun is shining brightly. We might see 1000 suns reflected in those 1000 pots of water. Actually, there is only one sun. 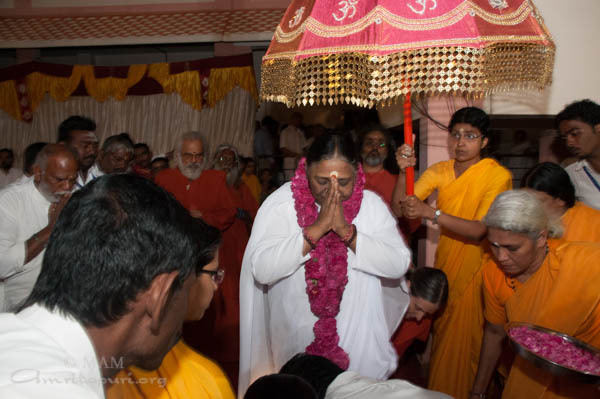 Similarly, the Atman is just one. 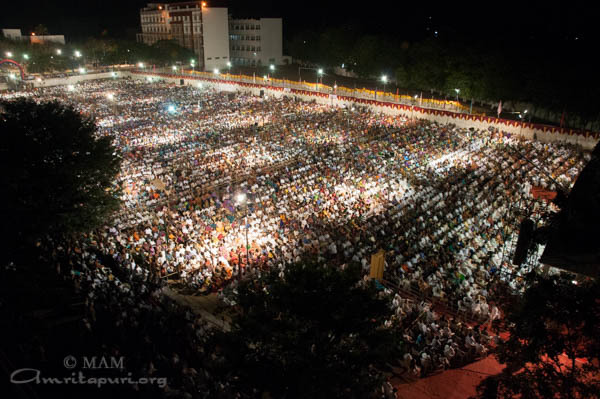 This Atman is all-pervading. 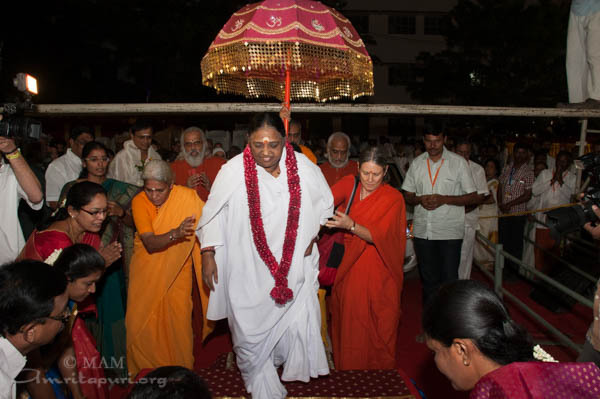 In order to explain this, Amma told a story, “Once, three people named Madhava, Govinda and Keshava were walking. One person called from the back, ‘Hey! 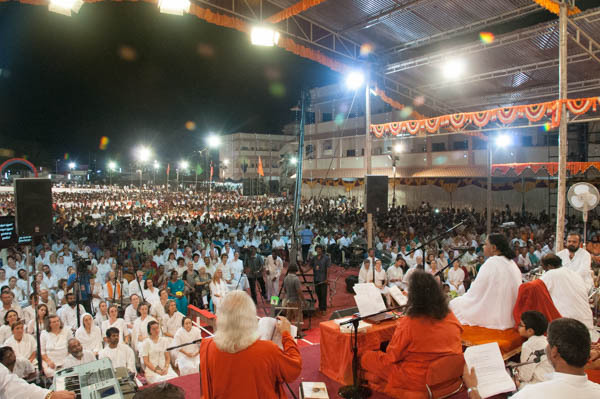 Madhava!’ and Madhava turned back. Next he called, ‘Hey! 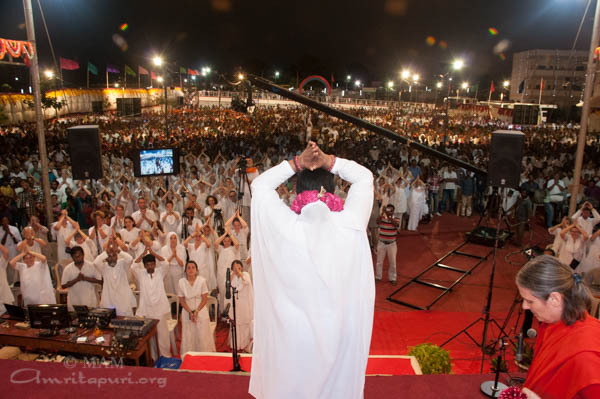 Govinda!’ and Govinda turned back. Then he called, ‘Hey! 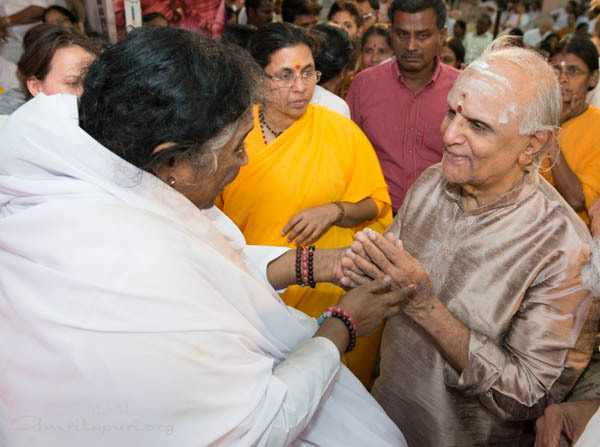 Keshava!’ and Keshava turned around. Finally, the person called, ‘Hey! Monkey!’ and all three of them turned back. This shows that the identification with our animalistic tendencies is still very strong. “Merely repeating scriptural statements is not enough. 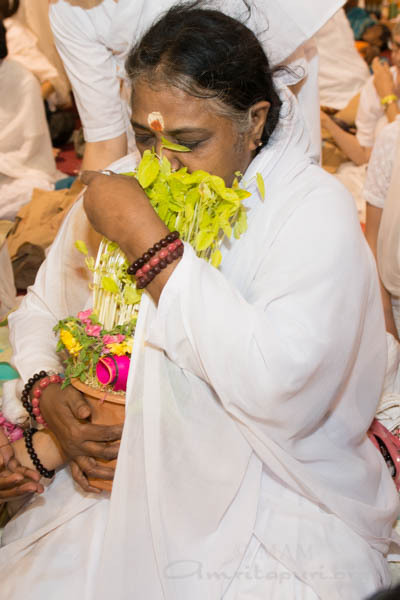 It is not enough to say ‘flower’- we need to become like a flower. If we write ‘honey’ on a piece of paper and lick it, we won’t experience the taste of honey. Similarly, merely verbalizing scriptural statements is not enough. One needs to get established in the truth. You have to become That. 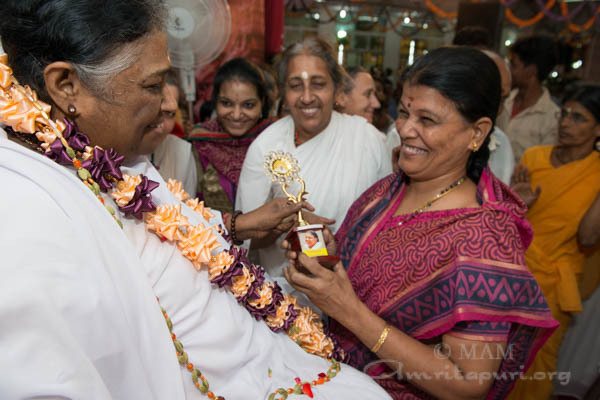 “Selfless service purifies the mind and makes a person fit to imbibe scriptural knowledge. 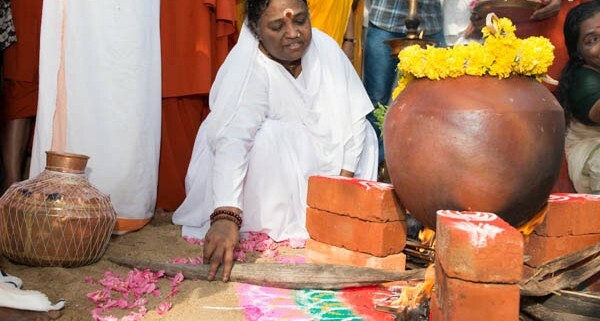 “The Puranas say that when the milky ocean was churned, the goddess of wealth, a horse, and a divine elephant appeared first. Then the deadly poison emerged. Out of compassion to save the universe, Lord Shiva consumed the poison. Only after that, the Ambrosia came out. The story indicates that only when we develop the attitude of acceptance even to poison, do we become fit to receive the Ambrosia. 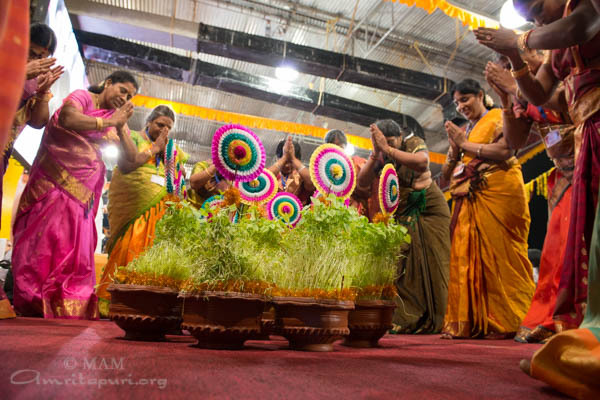 In order to celebrate the 20th anniversary of Brahmastanam festivals in the city, the local devotees had undergone a 9-day fast and performed a special ritual that involved the sprouting of seedlings in mud pots (Mulapari). Towards the end of darshan on the last day these mud pots were carried on the heads of the devotees as they performed a traditional dance. 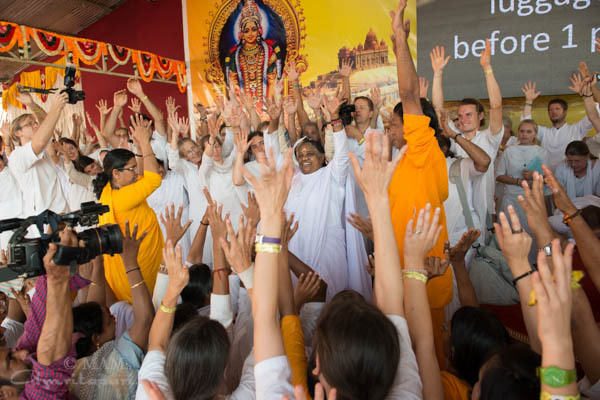 Amma and all those present delighted in the outpouring of their devotion and played and danced along with them. 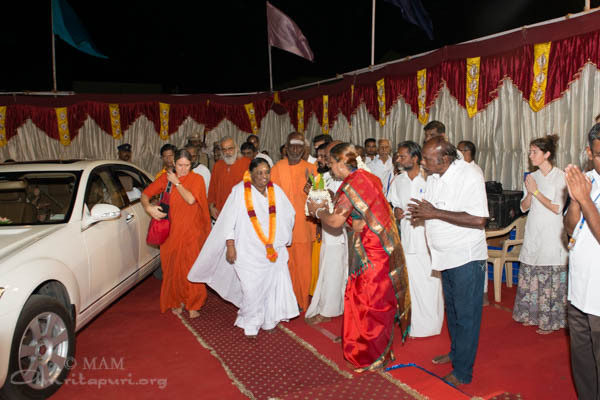 The evening Amma arrived in Madurai from Chennai, she served prasad dinner to everyone, sang bhajans and engaged in a very lively and profoundly spiritual conversation with her children. 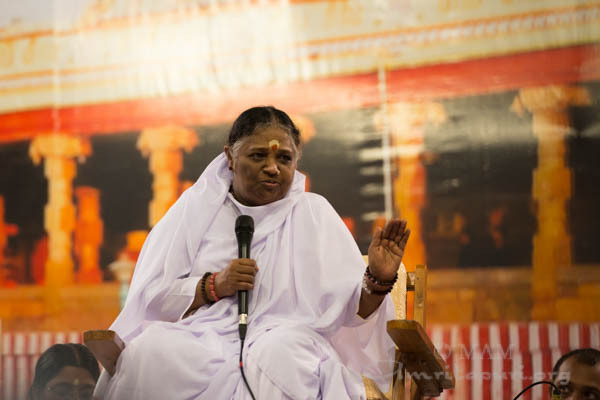 She elaborated on the importance of selfless service and the deeper significance of the upanishadic principle ‘Tatwamasi’. 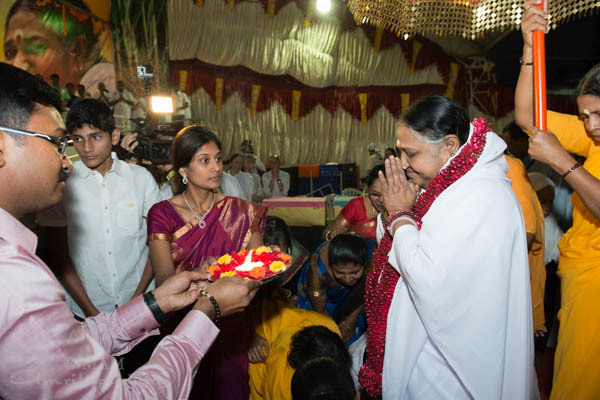 “Today is Maatu Pongal1 the devotees replied. 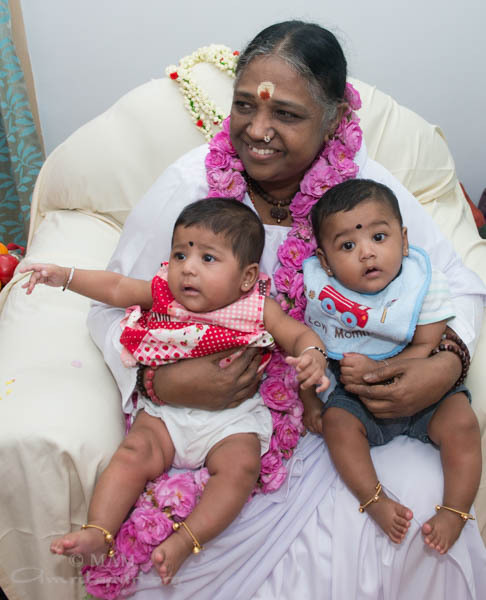 “Yes, Amma” said the lady. 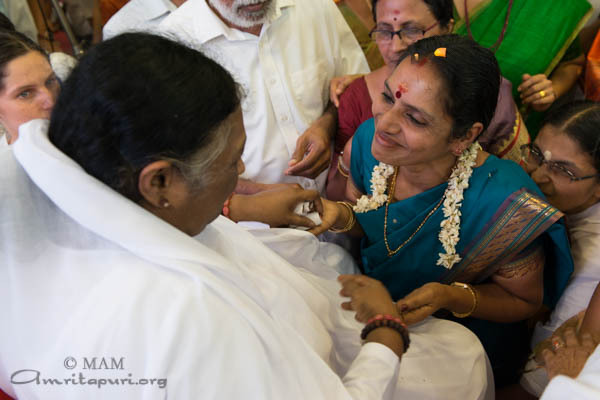 “Did you also bring some for me?” Amma asked with a mischievous smile. The lady started shedding tears. 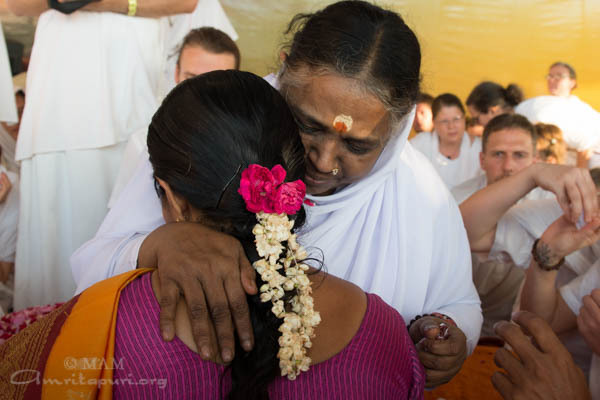 Amma asked why she was crying. 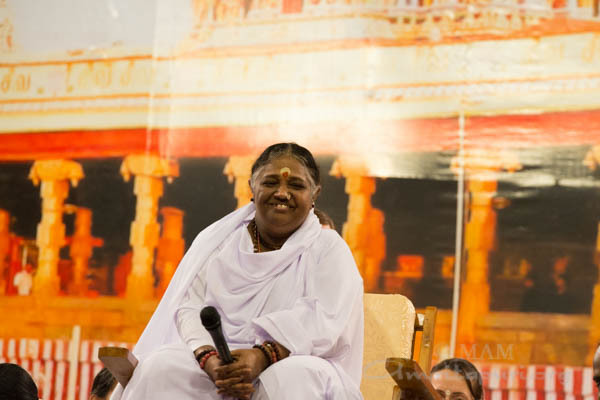 Amma and the entire crowd burst into laughter. 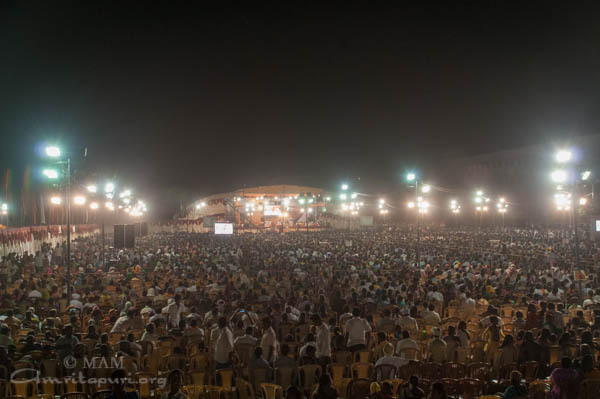 Amma said, “So, Meenakshi is the ruler, correct?4” Once again the devotees responded with loud laughter. 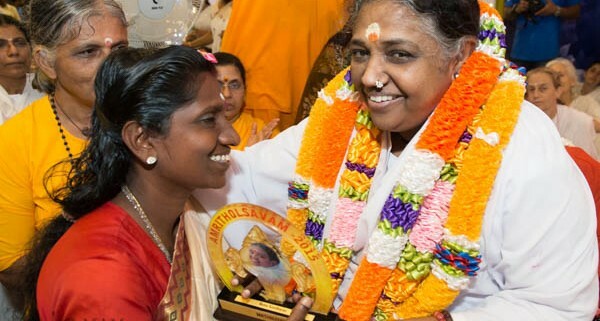 The husband then added that due to her seva at the ashram, his wife did not find time to cook Pongal. 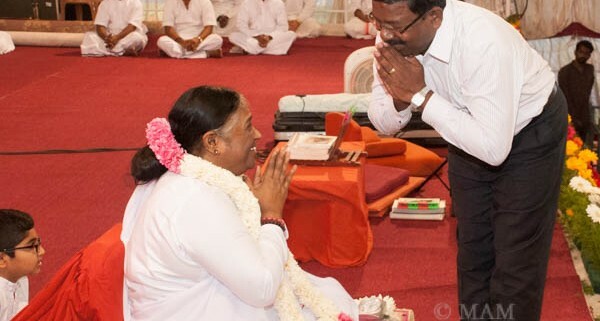 Through this simple yet meaningful incident Amma not only revealed that she is always with her children, constantly aware of their words and thoughts, but also that every act of selflessness and pure love reaches her directly. 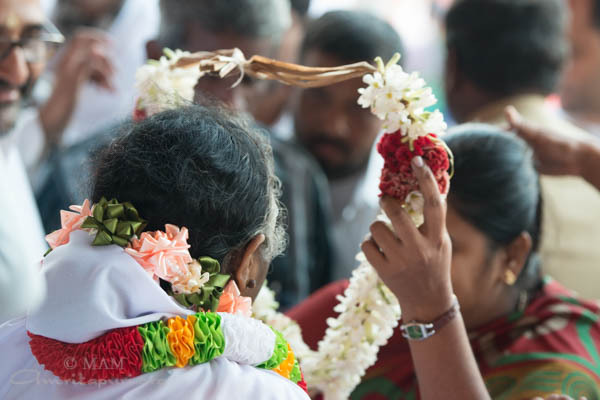 4. though Meenakshi refers to the goddess of the Madurai Meenakshi temple, Amma meant to say that the wife was dominating the household. 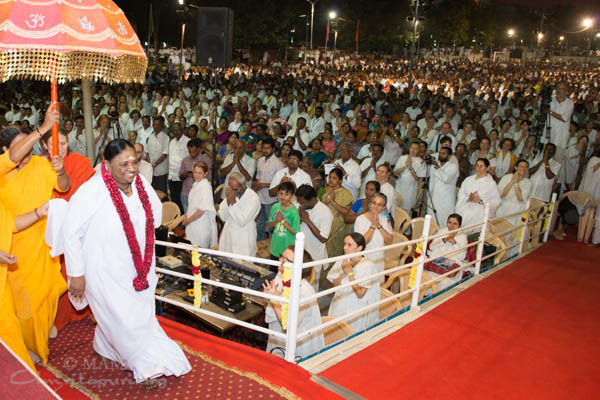 After a gap of two years Amma visited her Chennai ashram for a Brahmastanam Festival on Jan 14 and 15. 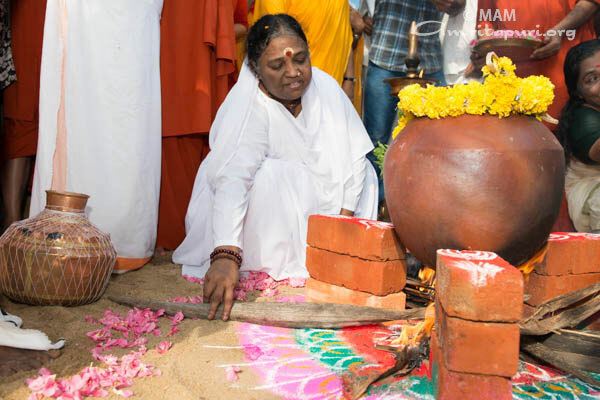 The day Amma arrived, Jan 13, was the day prior to the Pongal Festival. 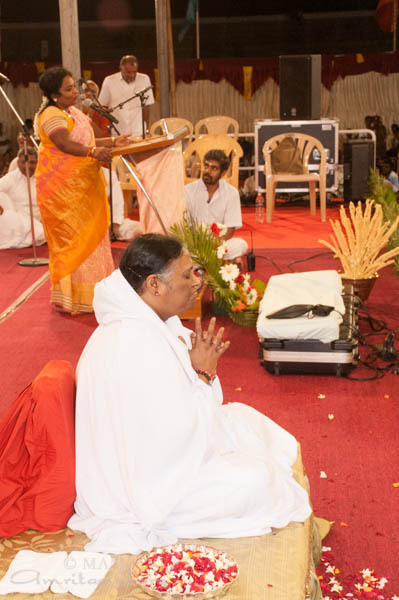 As Amma was serving dinner to everyone, she asked the devotees to tell spiritual stories and speak about the deeper significance of Pongal. 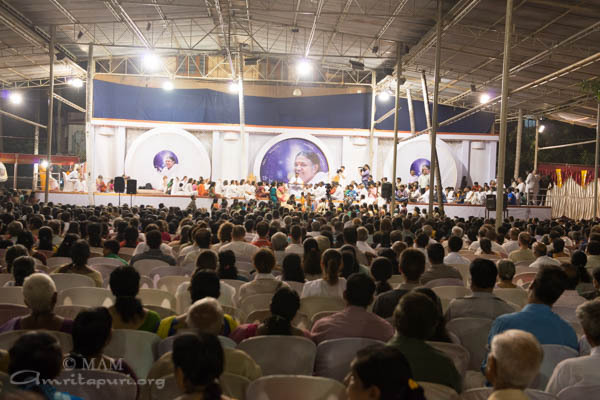 Due to the holiday period, the programmes in Chennai were even more crowded than usual. 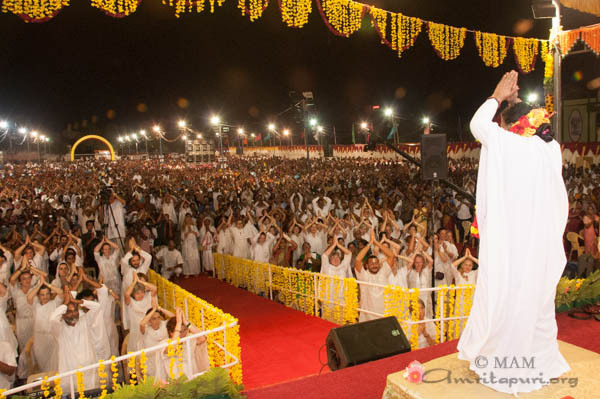 Thousands of devotees came to seek Amma’s blessings and divine inspiration. 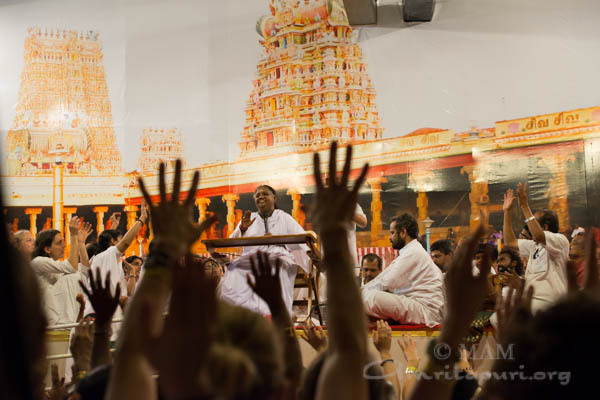 The two day festival turned out to be a true celebration of Tamil culture and arts. 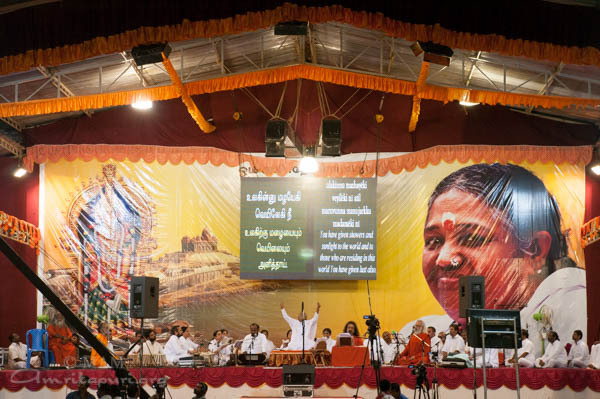 Many renowned artists came to pay their tribute to Amma and delight the audience with a display of their respective form of art. 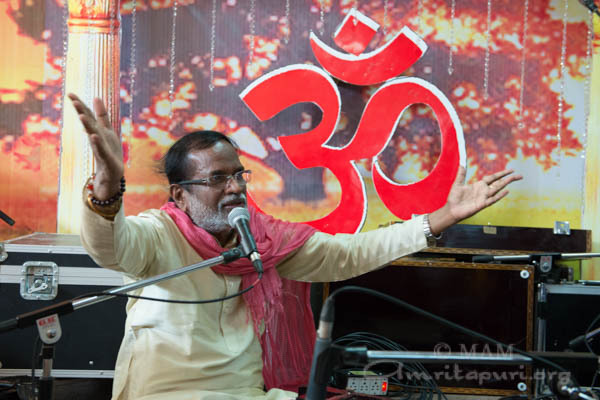 Amongst the performers were Grammy Award and Padma Bhushan Award winner Sri. 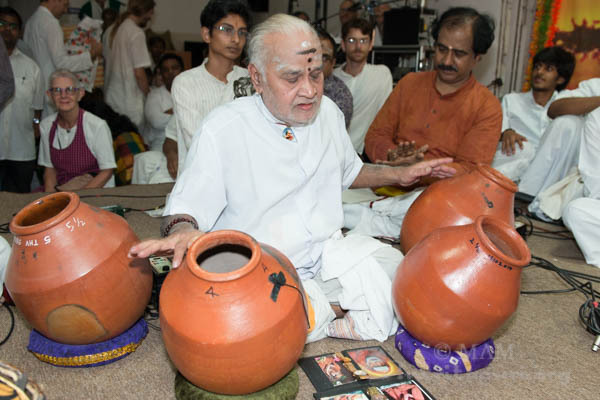 Vikku Vinayakaram (playing ghatam, a traditional mudpot instrument), Padma Vibhushan Award winner Sri. 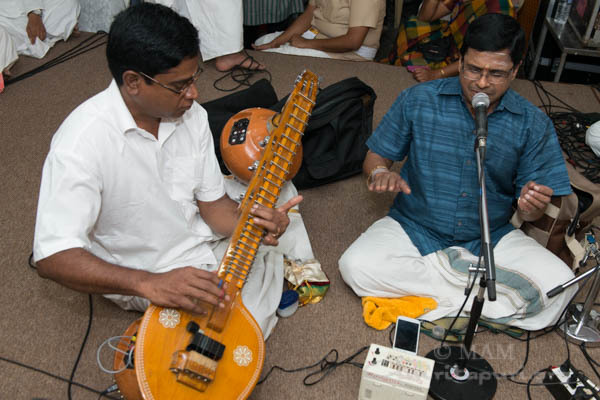 Umayalpuram K. Shivaraman (mridangam), Kalaimamani A. Kanyakumari (violin), Satish Kumar (mridangam) Kalaimamani G.J.R. 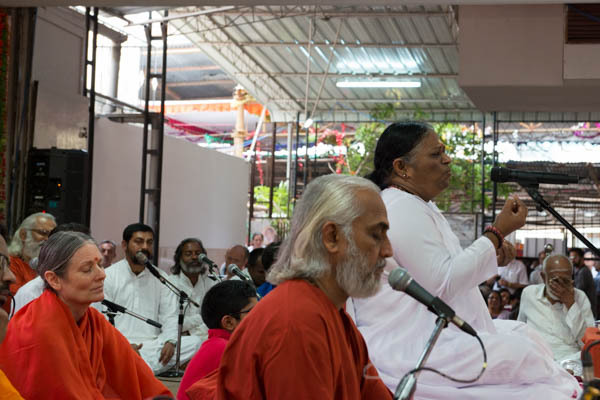 Krishnan (violin), Dr. Ganesh (vocal), Smt. 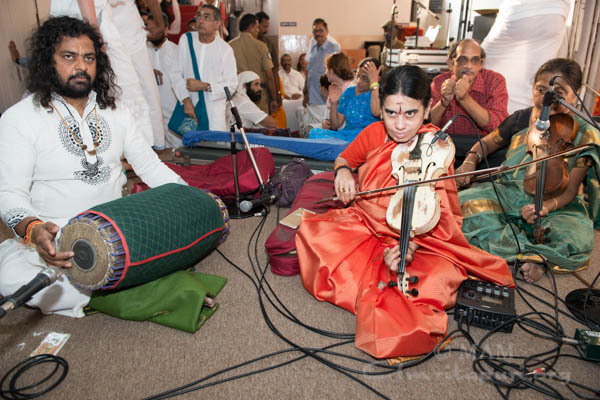 Jayalakshmi Sekar (veena), Sri. G.R.S. 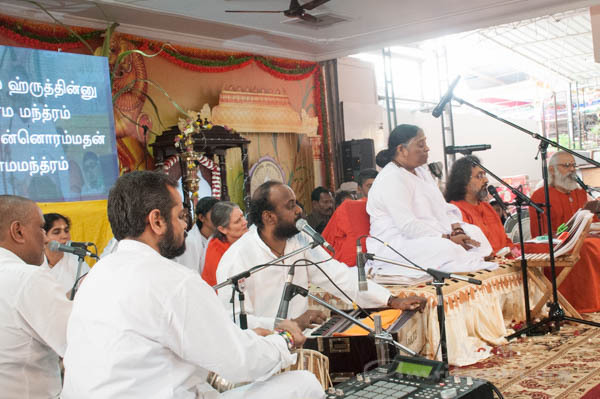 Moorthy (veena), A.S. Ram (carnatic keyboard), playback singer Smt. Binny Krishnakumar as well as renowned musician, director and playback lyrics writer Gangai Amaran. 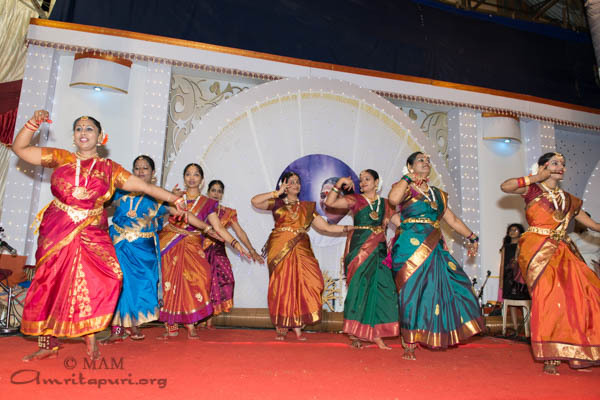 An impressive Kuchipudi dance performance was given by Kalai Mamani Sri Murthy. 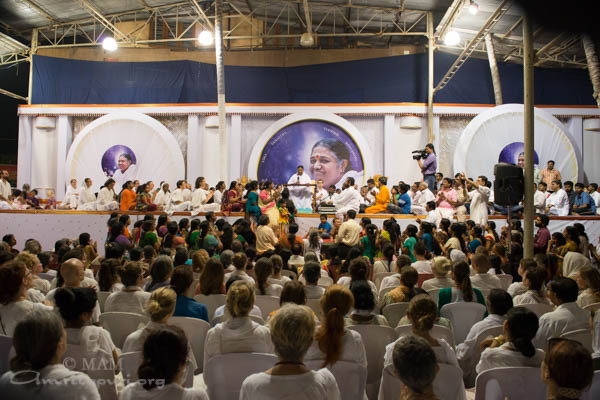 For the two days of Amma’s visit, the vibrant buzz of Chennai city was enriched by a much more profound and uplifting kind of buzz: the vibration of pure love, the joy of selfless service and the beauty of celebrating our unity in diversity. 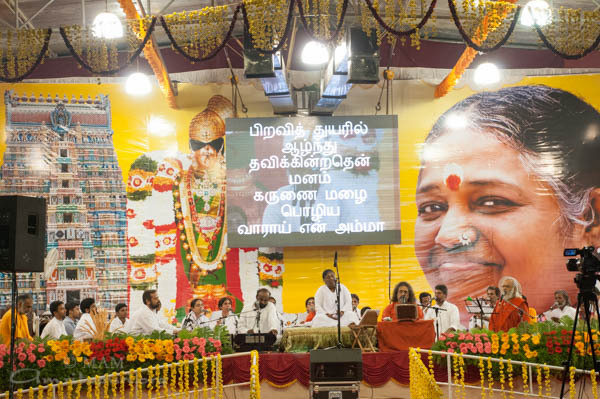 On the auspicious occasion of Swami Vivekananda’s 152nd birthday, January 12th, Amma held the first public program in the city of Erode, Tamil Nadu. 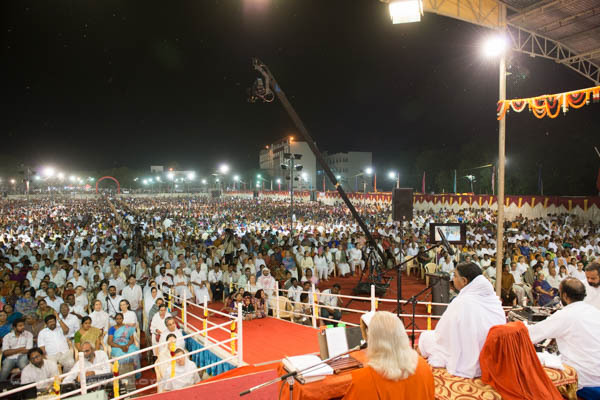 The event was held at the Vellalar College grounds – a huge field overflowing with thousands of devotees, gathered to partake in Amma’s satsang, bhajans, meditation and darshan. 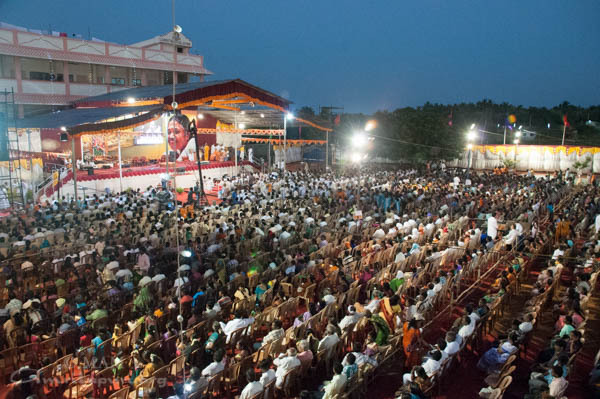 Erode is one of the most fertile and prosperous cities in Tamil Nadu, well-known for its worldwide export of turmeric and textiles. 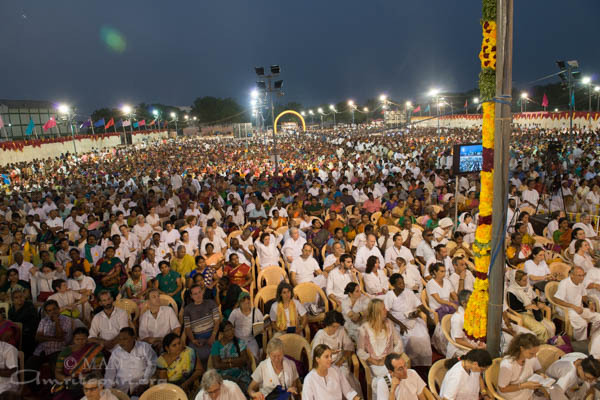 The residents of Erode are also known for their gentle and peaceful nature, which reflects in the low crime rate of the city. 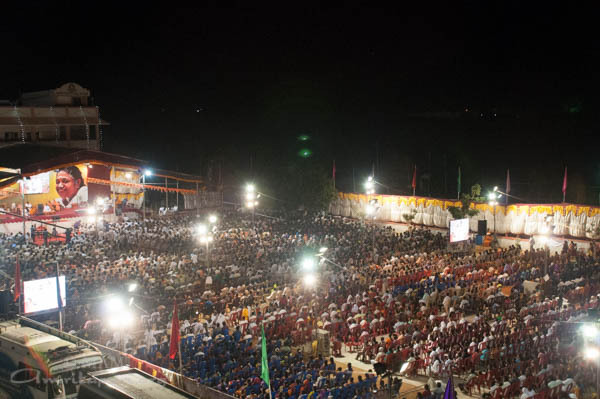 Indeed, throughout the program a silence and peace was palpable in the crowd. 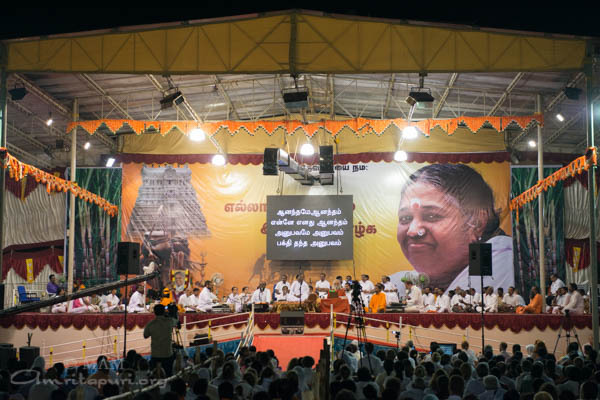 Among the dignitaries attending the public function were EVKS Elangovan, Congress Committee President and former Central Minister; S.K. 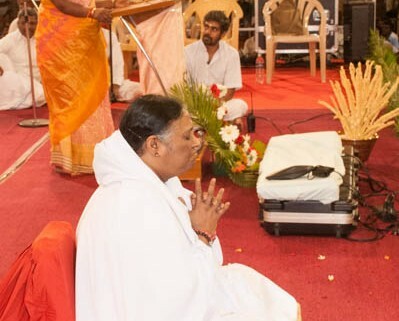 Mayilanandham, president of the spiritual organization Vedathri Maharishi; and C. Swami Nathan, Vice-chancellor of Periyar University. 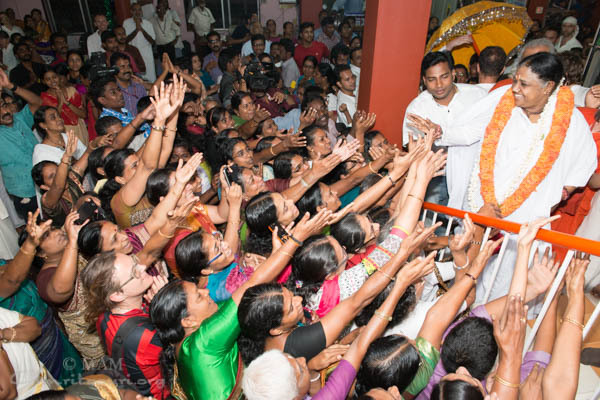 To the delight of the devotees, Amma led the Manasa Puja in Tamil and also sang many new Tamil bhajans. 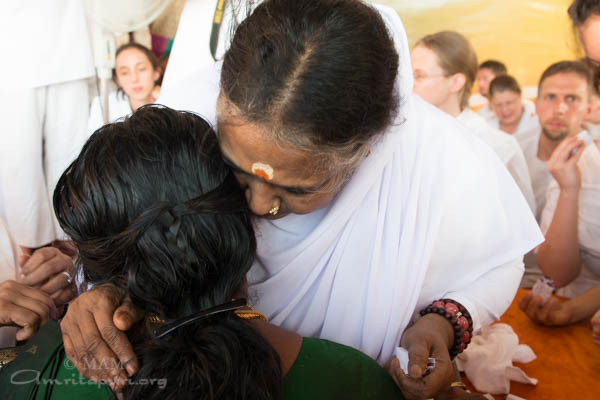 May the seeds of Amma’s love, which fell so abundantly onto the fertile ground of Erode, unfold and grow into trees of compassion. 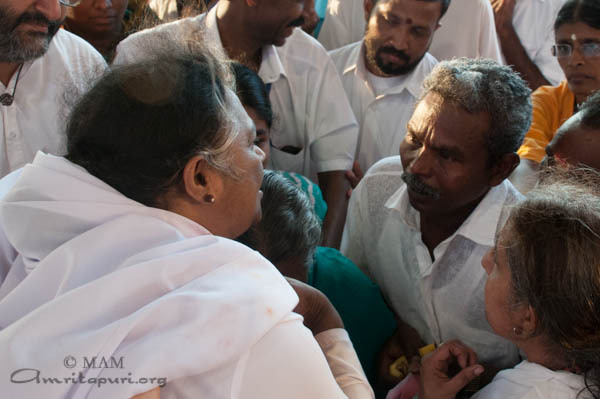 Amma arrived at the Kovai ashram in the morning, but the tour group didn’t arrive until the evening. 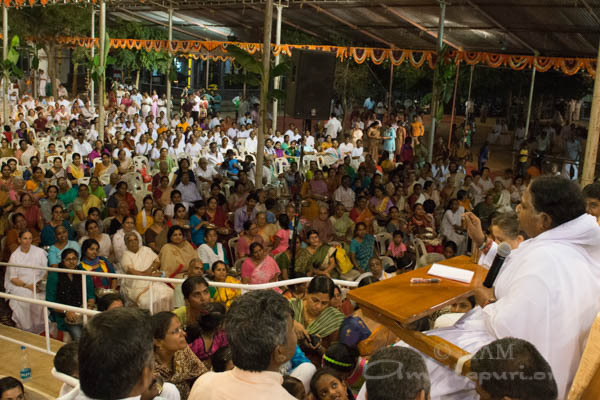 At dusk Amma sat with the devotees and volunteers of the program along with the big tour group. 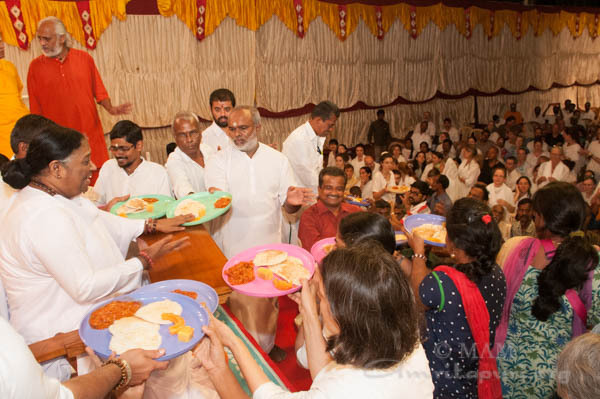 Amma sang a few bhajans and started distributing prasad dinner – chapathi, idli and curry. 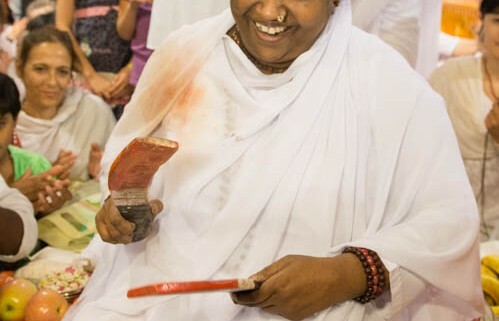 She asked people to share a joke or story with spiritual significance. Two or three people spoke about their life experiences. 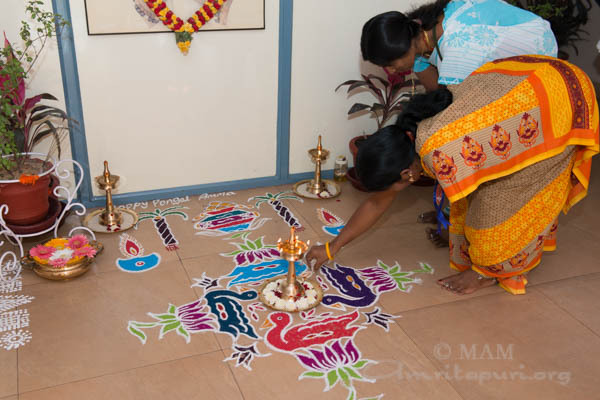 One teacher from Amrita Vidyalayam mentioned a mischievous boy in kindergarten. The boy had a bad habit of stealing significant objects in the class room. First the teacher tried to lovingly tell him that it was wrong. But the boy didn’t take her seriously. So she had to be strict with him. 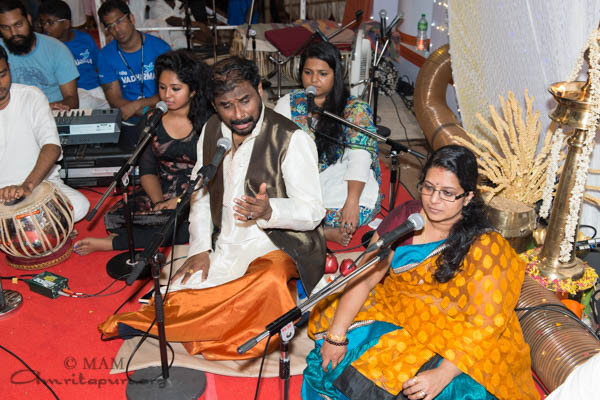 During Sri Krishna’s birthday celebrations the students narrated different stories about Krishna. 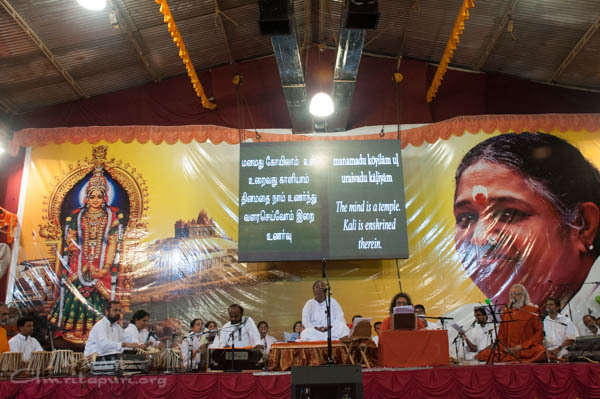 This particular boy stood up and asked his teacher, “If it was alright for Krishna to steal, why shouldn’t I?” Another child supported him saying, “That was why Krishna was born in the prison.” The teacher was shocked to hear this. 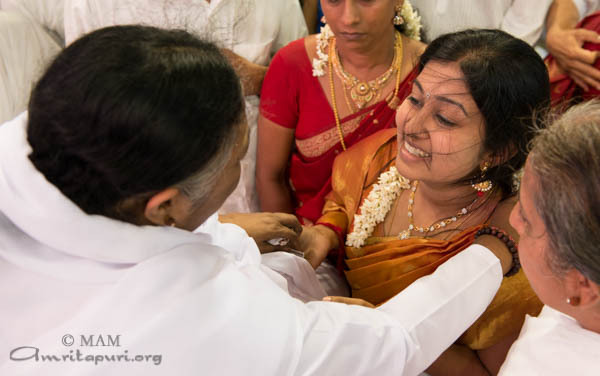 She prayed fervently to Amma and felt strongly that Amma answered her from within. She replied, “Actually, the gopis prayed to Krishna daily to visit their homes and steal their butter. 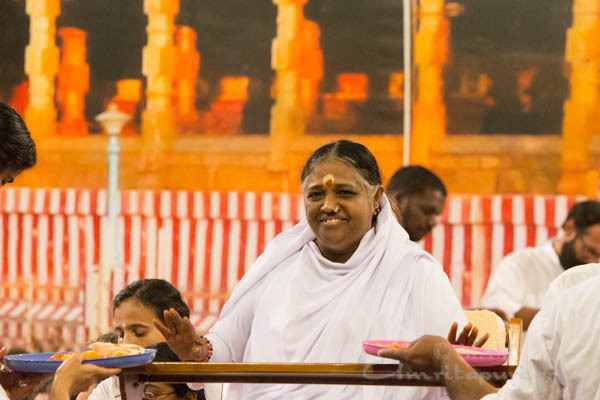 Answering their prayers, Krishna came and stole their butter.” The teacher was amazed to read a detailed response from Amma (about this particular Leela of Sri Krishna) in the next issue of Matruvani. 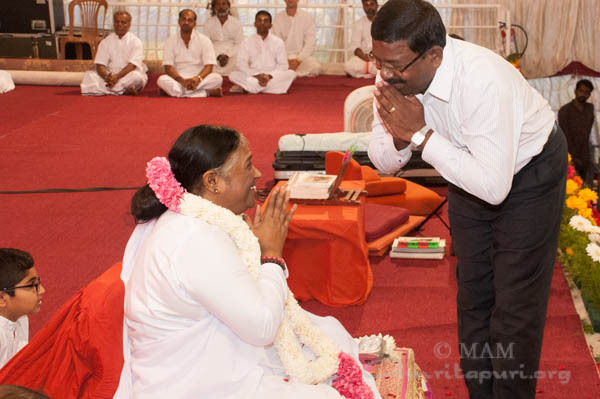 She thanked Amma for providing the answer to her. 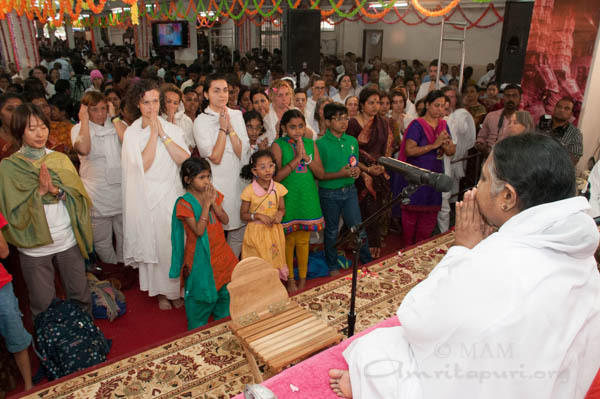 Amma decided to elaborate on the philosophy behind this to the children so that their faith in Krishna was not lost. 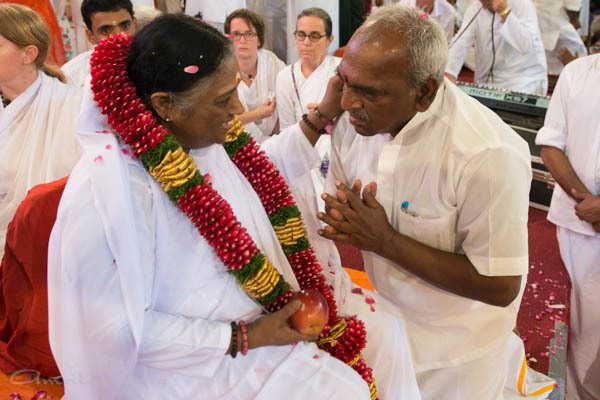 Amma said, “Sri Krishna was not a thief. Just as the Sun doesn’t need the light from a candle flame, Sri Krishna never needed anything from anyone. “Some of his childhood friends were poor. As Krishna and his friends went out to play, the friends complained that they were hungry. So Krishna visited the houses of different Gopis, took the butter and offered it to his friends. He didn’t do it for his own sake. 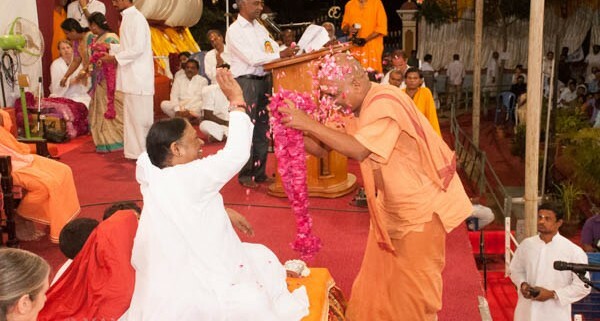 “Secondly, the family members of the Gopis were not fond of Krishna. They thought that Krishna was a mere cowherd boy. 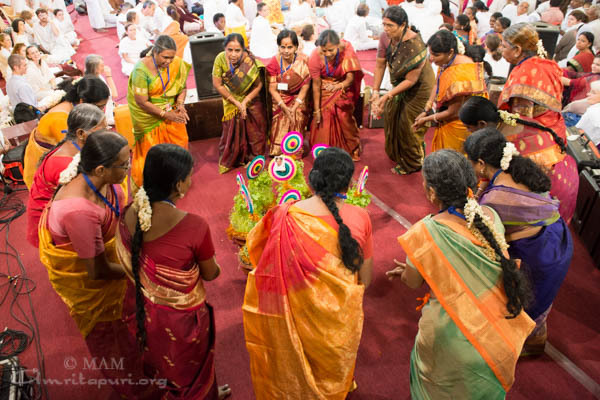 But the Gopis had deep devotion for Krishna. They longed to offer butter to Krishna, but were forbidden by their family members. 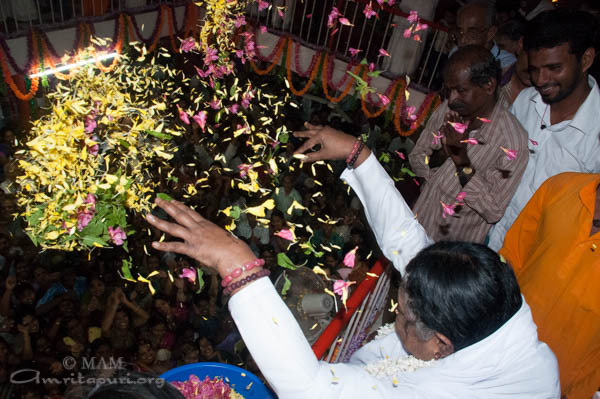 Even while churning the butter, the Gopis prayed to Krishna to accept the butter as their token of love. They stored some butter in pots and left to sell other milk products such as buttermilk, butter and cheese. 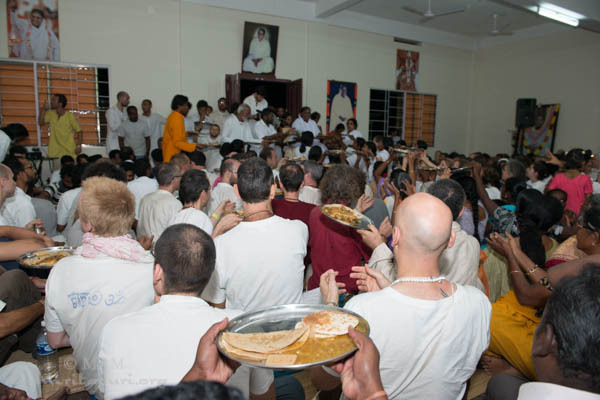 “By stealing the butter, not only did Krishna answer their prayers, but also stole their hearts. That was why he was known as chitta chora, stealer of hearts. 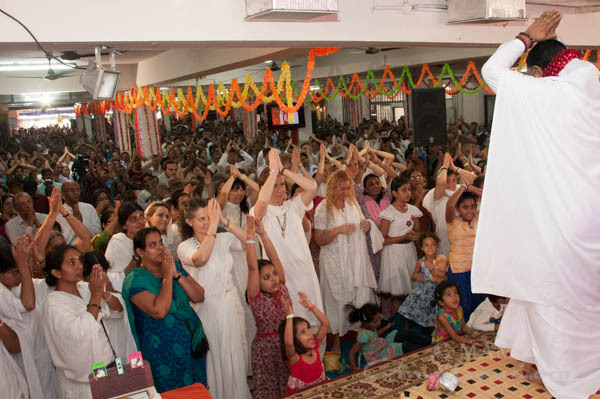 As the Gopis went out for business they thought constantly, ‘Will Krishna visit my house today? 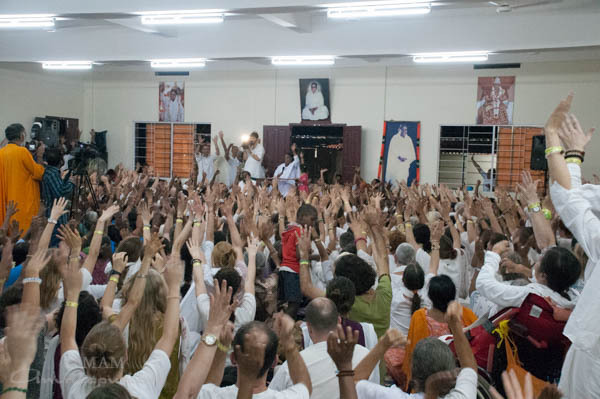 Won’t he grab his share of butter?’ Thus they were constantly thinking of Krishna.